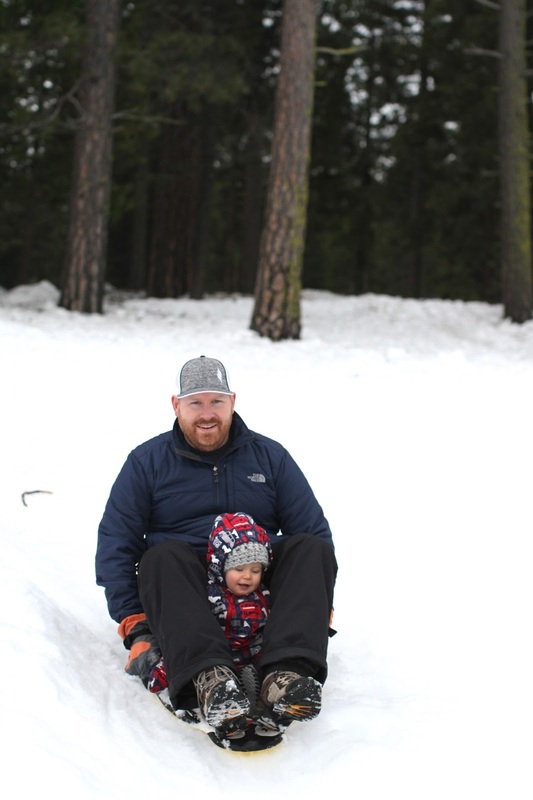 While everyone else was gathered around tv sets watching the super bowl, we were up in the mountains enjoying some snow play. I actually joked to my brother the day before that we were going to spend several hours in the car for 20 minutes of snow play. Thankfully, it went better than that! ^^ Somehow, in a way only Isla can do, she ended up going down the hill backwards...when she started out going down the right way. When we got to the snow, the kids really did only manage about 20 or 30 minutes of play before starting to complain. I was thinking that I couldn't believe my joke was actually becoming a reality. But, we went back to the car and filled up their bellies with food and they were then ready for round two. On round two, I wore Callum on my back, which made things much easier for all of us. Also, we walked down to the frozen lake to play, which was super fun. Connor enjoyed riding all the little ice hills and the kids just had fun with how much more slippery the lake was. This time, we actually had to force them to leave. It ended up being quite the good and fun day. Speaking of the frozen lake, I've never been on one before. I was pretty paranoid about the whole thing. The ice was several inches thick, but I still felt paranoid. I actually jumped up and down on it a few times to make sure it was safe for the kids. And, I certainly didn't want to wonder all the way across it like some people were doing. You know, just in case. It felt a bit like a bucket list item. One I had never even thought of before, but was super cool doing. And because this is my new obsession, here is a little video from our day.